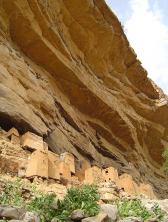 The ancient Dogon tribe of Mali is one of Africa's most fascinating but it is also a vanishing one. 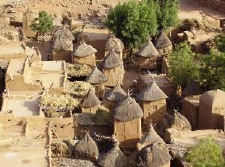 The Dogons apparently originated from the West bank of the Niger, fleeing from the Mossi people around 1490 and taking refuge in the hills of Bandiagara where they have continued to live resisting being conquered by first the Muslims and then the French. 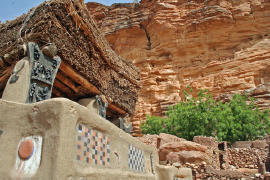 Today they number between 400 and 500 000 people; their isolated cliff-dwelling habitat in the side of the hills close to Timbuktu has contributed to the fascination the world has with their ancient mythology which remains shrouded in secrecy and mystery to this day. Because of this isolation their art has remained one of the most authentic on the African continent and being intensely spiritually motivated it has remained mostly intact. The visual delights of their skilful carving and dramatically colourful masquerades make them even more enchanting for the beholder. Art masks known as 'Inima' contain a life force called 'nyama' and there are over 60 different kinds of masks in Dogon culture all intricately carved and worked in red, black and white and earthy brown natural pigments. Unfortunately outsiders are only able to view a few of the ceremonies involving masked dances known as 'damas'. These days most of the masquerades are performed for tourists and the traditional ones are kept secret. 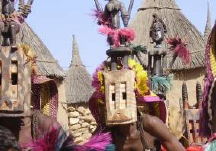 One of the more public dances includes the Dance of the Antelopes with rectangular box-like masks with horns coming out the top. The Sirige mask is an elaborately decorated mask carved from the branch of a single tree. 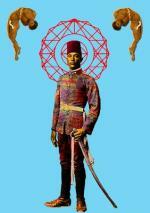 It is symbolic of binding the earthbound Dogon people to the celestial world of heaven where the afterworld exists. This sculpture can be up to 6m high and requires great skill in managing it during performances since it is held by the dancers teeth and is swung from side to side to represent the arc of the sun. It is only used in funerals for men who were alive during the Sigui festival which takes place every 60 years and can continue for days. (Next one being in 2027). There are two masks representing women: The Yana Gulay mask impersonating a Fulani woman made with cotton cloth and cowrie shells and the Satimbe mask representing women ancestors who have knowledge of spirit access to the afterlife. 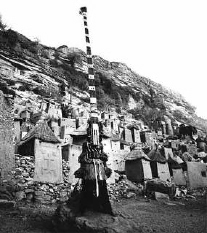 The Dogon spiritual world is governed by three cult beliefs: The Awa society, cult of the dead and responsible for anything concerning death and mourning, the Bini, cult of communicating with spirits and the Lebe, cult of earth and nature, concerned with all things agricultural including building altars out of clay. The Dogons are essentially animists including worshiping the ancestral spirit Nommo with festivals and mythology in which the star Sirius also plays a role. There are influences of Islam, Christianity and other religions as evident in the variety of buildings found in their villages. One must make mention of their architecture which is one of the most appealing and interesting forms of clay building in Africa. When grouped together in villages against the cliffs they are exceedingly picturesque. A village can be composed of one man's multiple wives' homes each with their own granary hut (the ones with the conical roof). 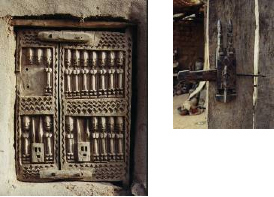 A striking design feature of Dogon architecture are the carved shutters, doors and doorways which portray ancestral figures to protect the people and property inside. They have become collector's specialist items in recent years and authentic ones of some age are fast disappearing into private collections. Door locks found on granary doors give us a wonderful insight into the abstract and symbolic use of animal and figural imagery. The representational carvings of ancestors serve to keep spirits at bay and offer protection from worldly and unworldly sources of harm. The Toguna is a hut created for meetings for men only and is designed so that one can't stand up in them. This encourages even tempers and restraint in behavior should things get heated! Now for the really interesting part of the Dogon tribe! Dogon oral tradition tells of tribes people being created by gods who descended from the sky aboard an alien air craft. Or rather they landed on earth in an ark that made a spinning and noisy descent to the ground bringing with them information on the solar system. The tribe certainly has a deep knowledge of cosmological facts that are astounding given the fact they have known about them for thousands of years such as the Earth orbiting the Sun as well as Jupiter's moons and Saturn's rings. In their culture they worship Sirius and a small planet they call Po Tolo in their language. They have marked the orbit of the stars encircling Sirius including this tiny star we call Sirius B. Po means smallest seed and Tolo means star and together they refer to human creation which plays an integral part of the Dogon tribe's ritual during masquerades and festivals. The Nommo, spirits whom they worship, are amphibious beings and they special names like The Monitors, The Teachers, the Saviours and the Spiritual Guardians. It is far more likely that in fact they are ancient Egyptians who took with them the sacred knowledge of the stars when they fled. Egyptians believed that Sirius was the place souls went to after death. To learn more about these remarkable people have a look here.